Most of day one was spent loading, sorting, unpacking, and storing gear. Scientists do not travel light. There were more action packers on board than I have ever seen in once place. At midday, we had a safety training, which consisted of learning how to put on a survival suit and how to use the coffee machine without flooding the galley. For night work, I was assigned a mustang float coat, a water activated flash light, and satellite locator, so that they could find my body if I went overboard. 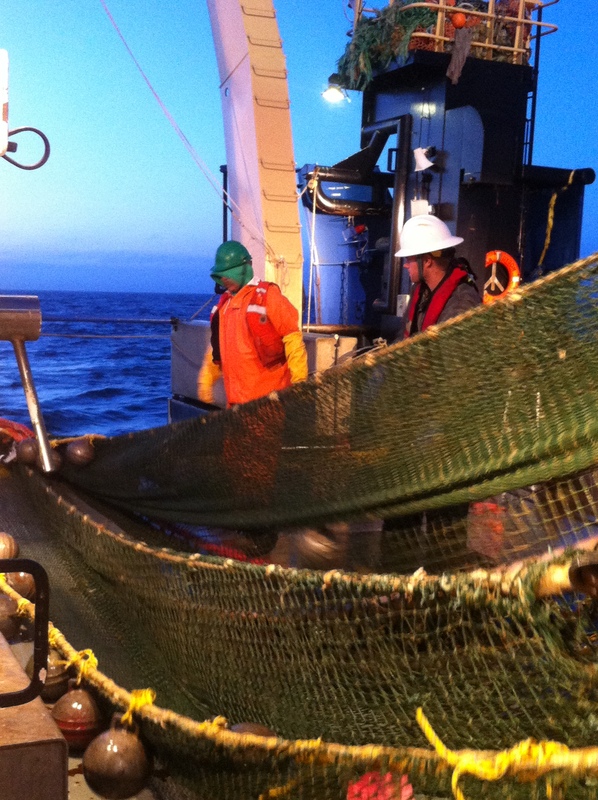 After dinner, work shifted to putting together various nets and the CTD which I will describe in more detail later. We got underway at about 8:00 PM, just as the sun was setting. I slept for an hour and was woken at 10:30 to begin my shift doing zooplankton tows. The first tow uses a Methot net, which is a large square steel frame attached by d-rings to a heavy mesh net, ten meters long. The net ends in a plastic sieve tube called a “cod end” that keeps any jellies from escaping. The net is quite heavy, and it takes four of us to guide it as a crane raises it off of the deck and then lowers it over the side. The net is dragged at the surface for twenty minutes. In the darkness of night, it glows slightly green as ctenophores and other bioluminescent jellies smash into it. After the Methot net is retrieved and secured on deck, we leave the collected jellies for a few minutes to go deploy the next net, called a Multi-net. The Multi-net is a steel box about the size of a dishwasher with a funnel entrance and five separate fine-mesh nets hanging off of the back. The net also has a heavy “fish fin” that acts to drag it down and keep it moving straight. The four of us work the net to the edge of the boat, open the back gate, and use two winches to lower it overboard. Once in the water and if the bottom depth allows it, the Multi-net gets dropped to a depth of two hundred meters and the first net is opened. The Multi-net allows you to “carve up the water column.” Each net can be triggered remotely to open and collect a horizontal sample of zooplankton at a specific depth. The electronics also allow you to measure how much water volume flows through the net. Each net is about two meters long, made of a fine mesh that funnels plankton into a soft sieve or “cod end”. While the Multi-net is “fishing,” we sort, classify, and measure the jellies collected in the Methot net tow. The Seward Line Transect is made up of fifteen stops or stations. Each one designated as GAK1, GAK2, etc. Once we finish sampling a station, the boat speeds up and drives us ten nautical miles to the next station. Last night we managed to sample four stations, finishing the last one just as the sun rose around 7:00 AM. When daylight comes, the Tiglax makes its way back to the place the night shift began. All of the day-time sampling has to be done at each of the stations we sampled the night before. 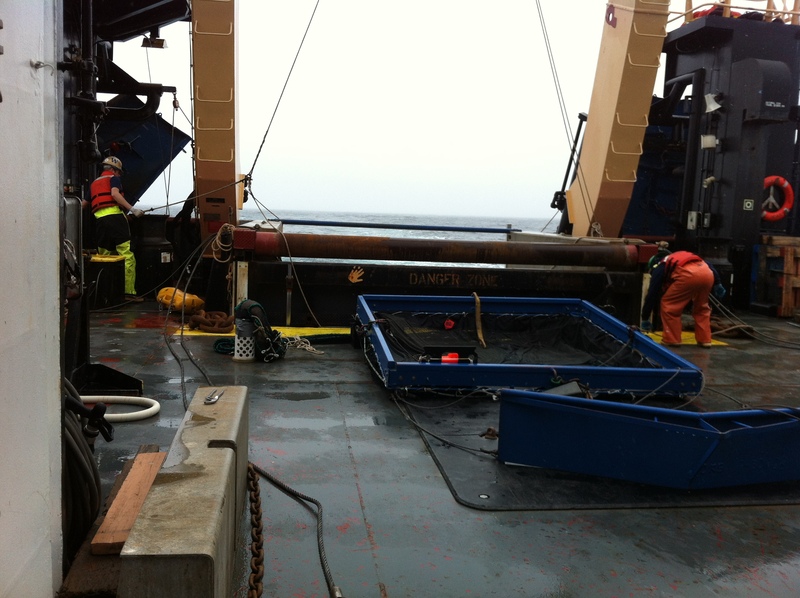 The day-time sampling uses different tools, the main tool being the CTD Rosette Sampler. The Rosette is a steel cage with water collecting “Niskin Bottles” and lots of other instrumentation strapped into the cage. There are fifteen bottles and each is triggered by computer to close at a specific depth. 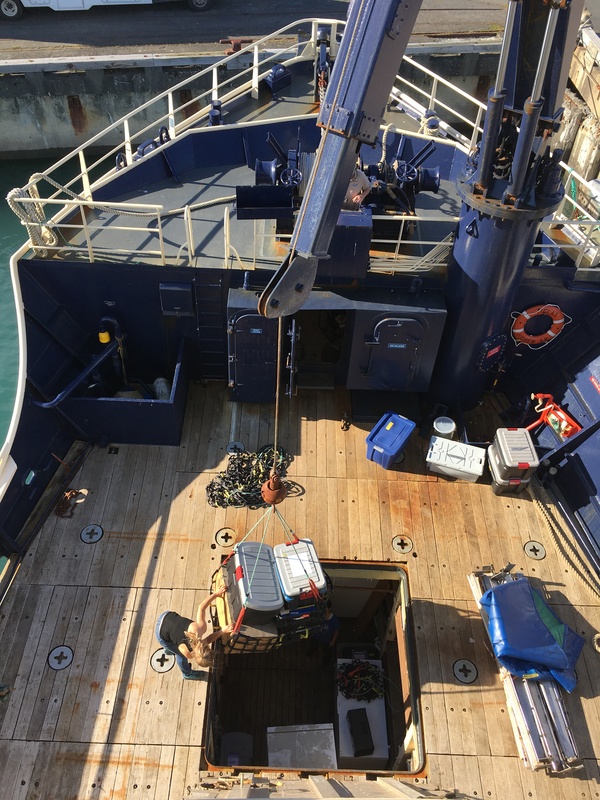 This allows the scientists on board to measure a variety of physical and chemical properties of the water at depth. The night shift was surprisingly dark. That may sound obvious, but after a long Alaskan summer, with campfires and hikes that often went past midnight in perfect daylight, dark is an adjustment. The night was beautiful and warm, but the work of deploying and retrieving nets was tedious and physical. By morning I was exhausted, but I was reminded repeatedly that there are no cutting corners. No matter how tired you get, each sample needs to be meticulously cared for. After the sun came up, I forced myself to eat some breakfast and then I fell in bed for a hard sleep. I could only stay there for a couple hours before my well-trained, morning-self wanted to greet the day. 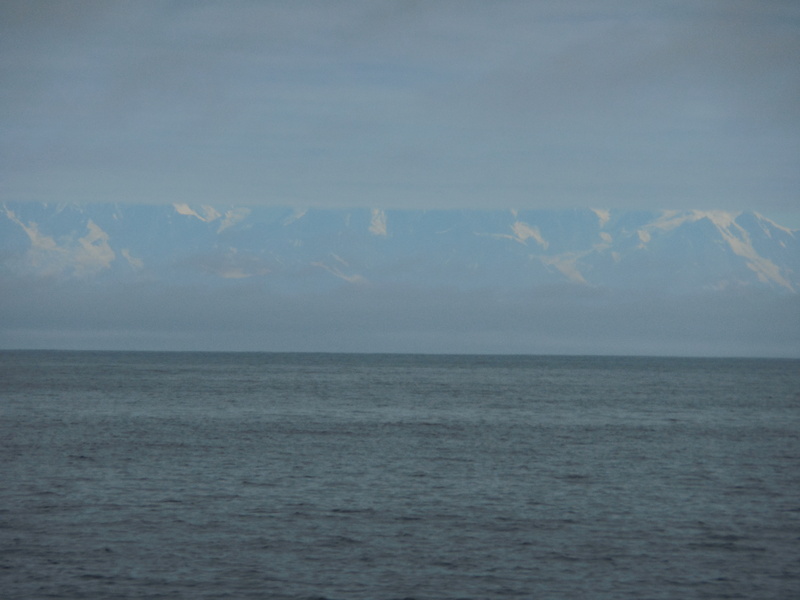 The day was flawless, picture-perfect, sunny and calm, the kind of days you don’t often seen in the stormy Gulf of Alaska. Lots of seabirds, including black-legged kittiwakes, pelagic cormorants, and sooty and flesh-footed shearwaters. Today was our first chance to use the Methot net, and it was a lot of fun! The Methot net is smaller than the net that we usually use, and it is used to catch smaller organisms. Today we were targeting euphausiids. We thought we saw a pretty good aggregation of them on the 120 kHz acoustics data, where they appear the strongest of the three frequencies we monitor. We needed to validate that data by trawling the area to find the source of the backscatter and make sure they really were what we thought they were. There are many scientists who use data on euphausiids, so this was a good opportunity to provide them with some additional data. Because we’ve been working mostly on larger organisms, I was excited for the chance to see what a Methot net would pull up. It was very exciting that when the net came up, we had TONS of euphausiids! (“Tons” here is not used in a literal sense…we did not have thousands of pounds of euphausiids. That would have been crazy). Although we did not have thousands of pounds of them, we did have thousands of specimens. I’m sure thankful that we only had to take data on a subsample of thirty! I got to measure the lengths and widths of them, and using the magnifying lenses made me look very scientific. Along with euphausiids, we also found other species as well. We found tiny squids, jellies, and even a baby octopus! It was adorable. I’ve never considered that an octopus could be cute, but it was. We also measured volumes and weights on samples of the other specimens we found, and I used graduated cylinders for the first time since college. We would put in a few milliliters of water, add our specimens, and then calculate the difference. Voila! Volume. Good thing I remembered to call the measurement at the bottom of the liquid’s meniscus… I could have messed up all the data! Just kidding… I’m sure my measurements weren’t that important. But still – good thing I paid attention in lab skills. It was definitely a successful first day with the Methot net. 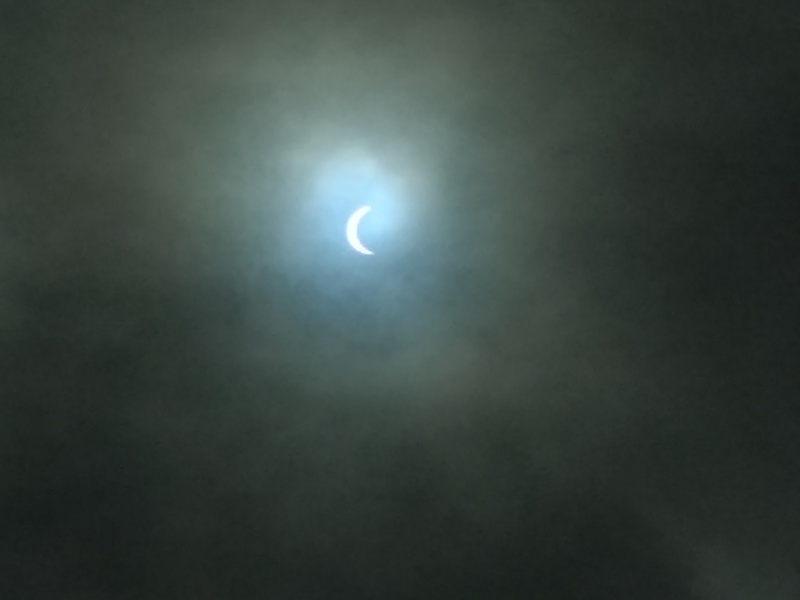 The big buzz around the ship today was the solar eclipse! I was even getting excited at breakfast while I ate my pancakes and made them eclipse each other. We got lucky with weather – I was nervous when I heard the foghorn go off early in the morning. Fortunately, the fog lifted and we had a pretty good view. 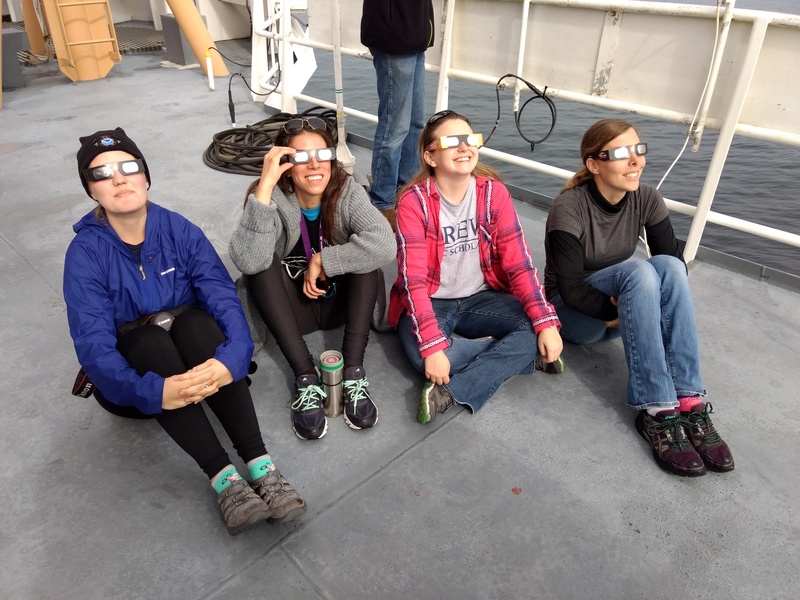 We all sported our cheesy eclipse shades, and the science team wore gray and black to dress in “eclipse theme.” Even though we couldn’t see the totality here, we got to see about 85%. We’re pretty far north, off the coast of Vancouver Island in Canada. The mountains are beautiful! Seeing land is always a special treat. The eclipse would have made the day exciting enough, but the excitement didn’t stop there! While the scientists and I were working in the wet lab, we heard that a pod of orcas was swimming within eyesight of the ship. We dropped everything and hurried to take a look. It was so amazing; we could see five or six surface at once. They must have been hunting. We only see orcas when we’re close to land because their prey doesn’t live in deeper waters. Deeper into the ocean we are more likely to see gray or humpback whales. It’s almost time for dinner…we sure have been spoiled for food! Last night we had pork loin and steak. I’m not sure that our chef will be able to top himself, but I’m excited to find out. I have heard rumors that he is very good at cooking the fish we’ve been catching, and that really makes me wish I liked seafood. Unfortunately, I don’t. At all. Not even enough to try Larry’s fried rockfish. Luckily, he makes lots of other food that I love. Tonight after dinner I think Hilarie, Olivia, and I are going to watch Pirates of the Caribbean 2. Last night we watched the first movie while sitting on the flying bridge. It was a pretty cool experience to feel the spray of the sea while watching pirates battle! That’s all for now; I’ll be back with more scientific fun soon! Krill (the type of euphausiid we studied) is one of the most populous species on earth. It basically fuels the entire marine ecosystem. Me next to chafing gear from AWT. Image by Meredith Emery. Science and Technology Log: Nothing But Net! 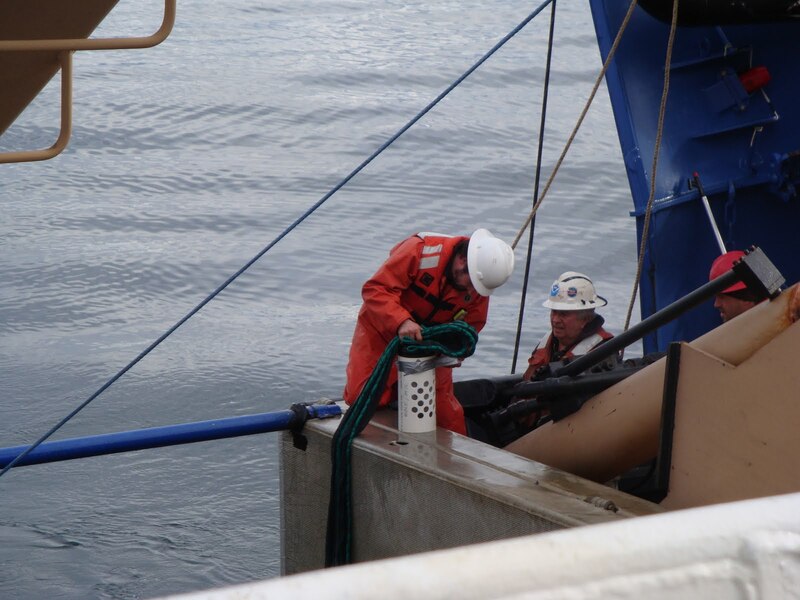 Once the scientists determine where and how deep they want to fish, based on analyzing the echogram, then the boat moves into position and the net is deployed. Safety is the top priority when working on the vessel. The deckhands all have to wear life jackets, hard hats, and good boots when working on deck because the conditions can be sunny one moment and stormy the next. There is some serious hardware at the back of boat. There are cranes, winches, and spools of wire ropes & chains. The Chief Boatswain is responsible for all deck operations and deploying any gear overboard. 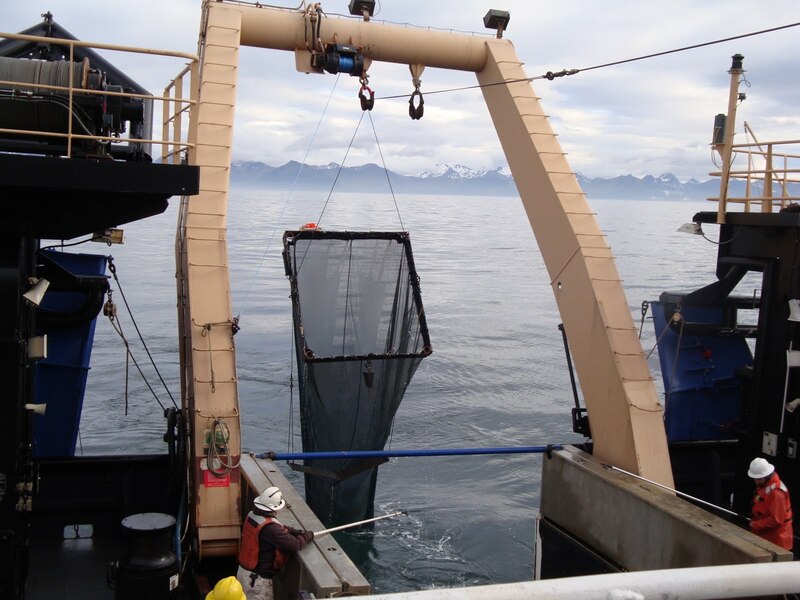 The following video illustrates the sampling process using an Aleutian Wing Trawl net. There is a camera (aka camtrawl) attached to the net along with a small pocket net. The pocket net is designed to catch tiny animals that slip through the AWT meshes. The pocket mesh only catches a small amount of escaping animals which can then be used to determine what was in the water column with the bigger pollock. The camtrawl has a pair of cameras that shoot stereo images of what is entering the net. The camtrawl was developed by NOAA scientists and its goal is to estimate the size and identify the species that enter the net using visual recognition software from University of Washington. The ultimate goal of the camtrawl is to be able to identify everything entering the net without ever having to actually catch the fish. A limitation of the AWT is that it can’t go closer than a few meters from the sea floor. Pollock are semi-pelagic so they are sometimes down at the sea floor and a different net is used. The Poly Nor’Easter (PNE) is used to trawl along the bottom of the Gulf of Alaska because the bottom can be rocky. The PNE has roller gear along its bottom to keep it from getting stuck. The opening of the PNE is 6 meters tall and 15 meters wide and also funnels to a codend. 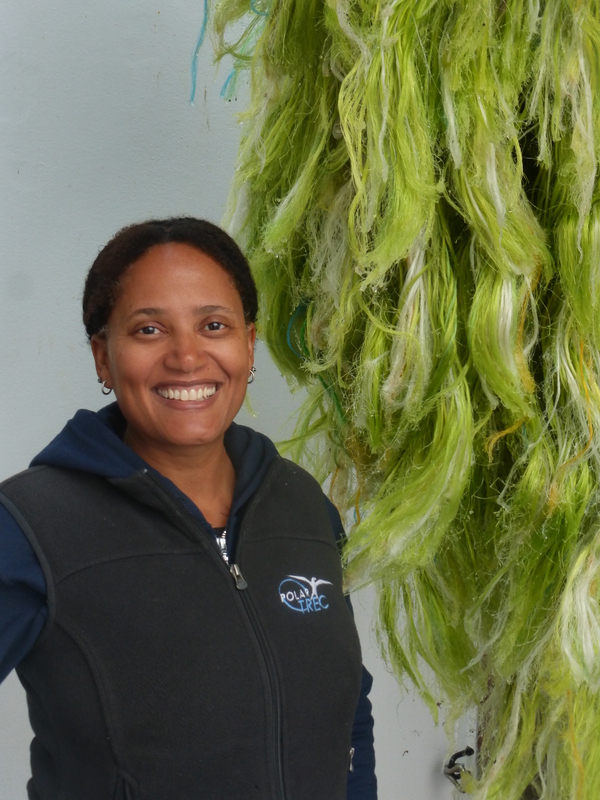 There is a third net on Oscar Dyson called the Methot and it is used to catch large plankton such as krill. 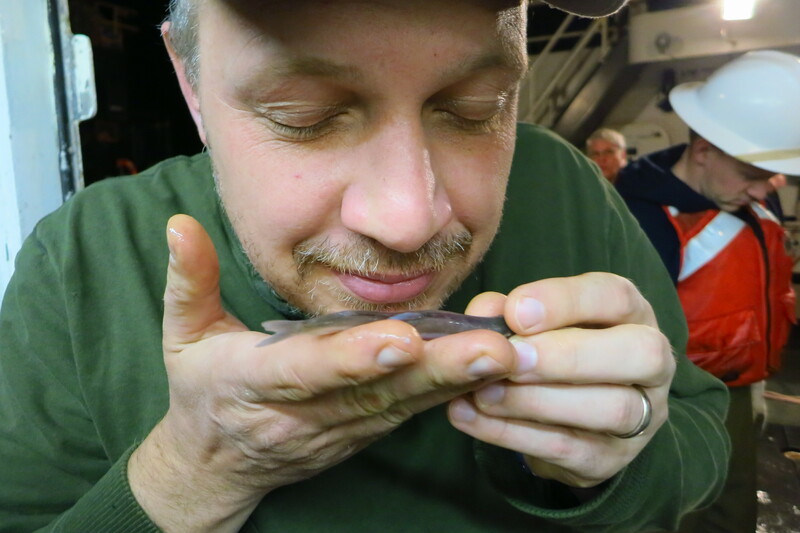 The Methot is so small that it sits on the deck and is easily lifted and put into the water. The net you use is determined by what you are trying to catch and where they are located in the water column. Chief Boatswain Ryan Harris managing Oscar Dyson crane. 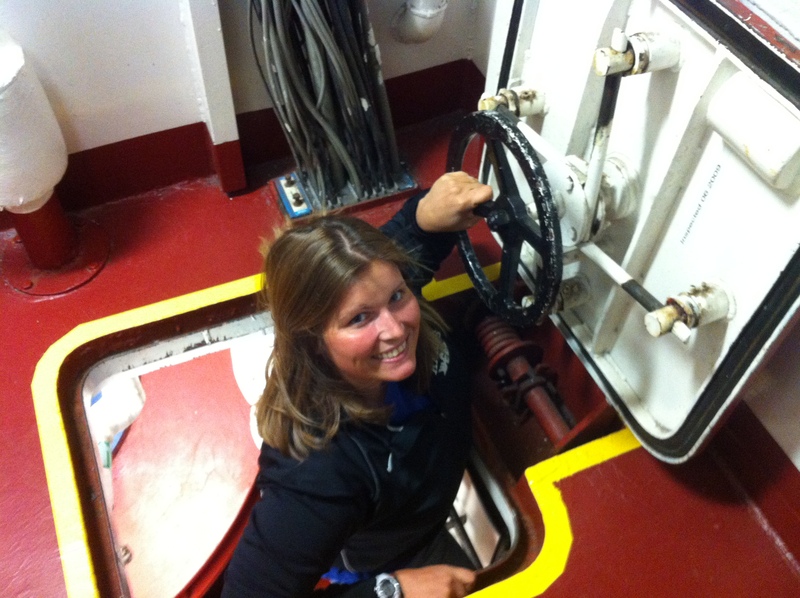 I am in charge of the deck operations on board the ship from deploying gear over the side to up keep of the ship. How long have you been working on Oscar Dyson? What is your favorite thing about going to sea on Oscar Dyson? I get to see things normal people do not. When did you know you wanted to pursue a career in science or an ocean career? 11 years ago I fell in love with the excitement of travel. What are some of the challenges with your job? Trying to keep all the gear working to complete the mission. What are some of the rewards with your job? I get to serve my country and leave something behind that me and my family can be proud of. Describe a memorable moment at sea. Seeing killer Whales 5 feet away. 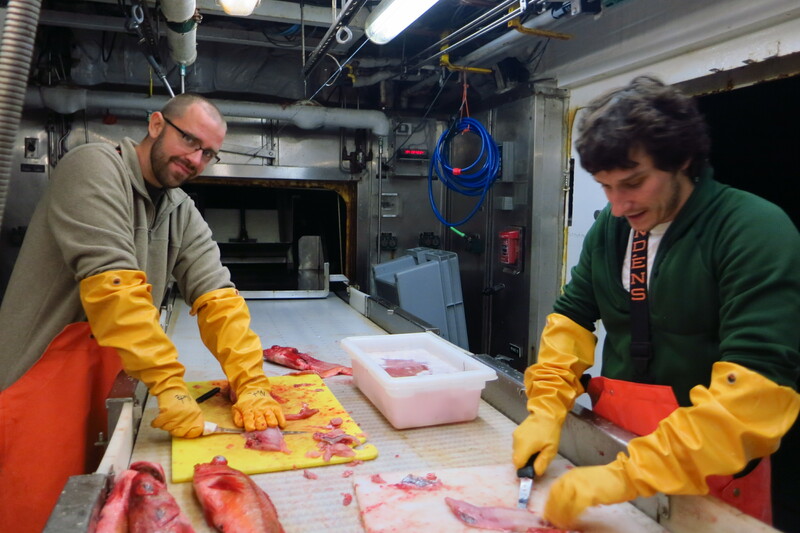 Lead Fishermen Tom Stucki on the NOAA ship Oscar Dyson. Image by Matthew Phillips. 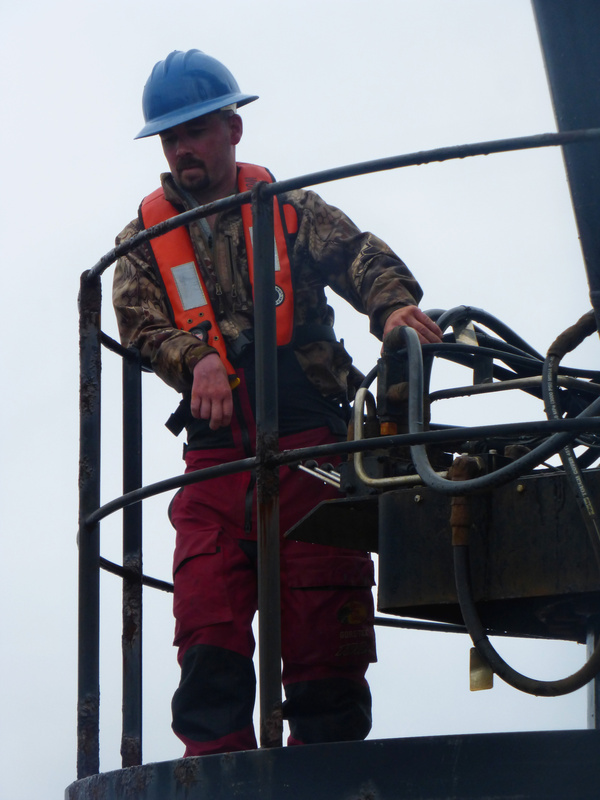 I run the winches for trawls, Maintain and fix the nets, help with maintenance of our equipment. Paint and preserve the ship when time and weather allows, clean up inside of ship. 2 months this time and a month long trip last year. I am a relief pool employee. I fill in where the fleet needs me. Why the ocean? What made you choose a career at sea? I grew up on the coast in a fishing community. The crew and work we do. Why is your work (or research) important? Our work is translated back to the commercial fleets so we don’t end up overfishing. Once I got out of the Army and went on my first successful Salmon fishing trip. What part of your job with NOAA (or contracted to NOAA) did you least expect to be doing? Traveling as a relief pool employee. Working 12 hour days for months at a time. Knowing that the work I am helping with actually matters and hopefully will have positive implications down the road. There are lots but its always nice in the middle of a trawl when you look up the sun is setting the water is flat calm and you think to yourself “yeah, I get paid for doing this. Operations of equipment to facilitate the needs of the science party. I love the challenge of creating something stable from something so uncertain and ever changing as the ocean. Seeing some of the creatures that the ocean has living in its depth. My work is important more for personal reasons, I am able to support my family and make their lives more comfortable. My work on the ship is nothing special besides understanding the rigging and being able to trouble shoot issues that arise just as quickly as they show up. I have wanted to pursue a career on the water for as long as I can remember, however it was my mother five years ago who pushed me to follow that desire. I enjoy seeing the creatures that we pull up from the ocean. The pay isn’t bad. If you are able to stay in for a long period of time, you can get a stable retirement. There was a time that we brought up a salmon shark in the net and I was able to get it back into the water by cutting a hole in the net and pulling it out with the help of another deckhand. It was exhilarating! Me in the survival suit. I will admit that my biggest concern with going to sea was the thought of falling overboard. Now that I have been on Oscar Dyson I have learned that safety is a top priority and there are a lot of procedures for keeping everyone productive yet safe. Every week there are safety drills such as fire, abandon ship, and person overboard. The one I like the most is the abandon ship because I get to try on the survival suit. The waters here are so cold that survival overboard is unlikely without the survival suit. It is comforting to know that the crew of Oscar Dyson work hard to keep themselves and everyone on board safe. I am no longer afraid of falling overboard because I’ve learned to be safe when navigating around the vessel and I have finally developed my sea legs – well sort of! The weather has been amazing with smooth sailing almost everyday. We did have a few days with some rolling seas and I had to put a seasickness patch behind my ear. Another cool NOAA website that lets you explore deeper into fisheries and this video shows you how to find information for educators and students. The average size of a Bering Sea commercial fishing net is 60m tall by 120m wide. August 6, 2013: Partly Cloudy or Partly Mountainy? 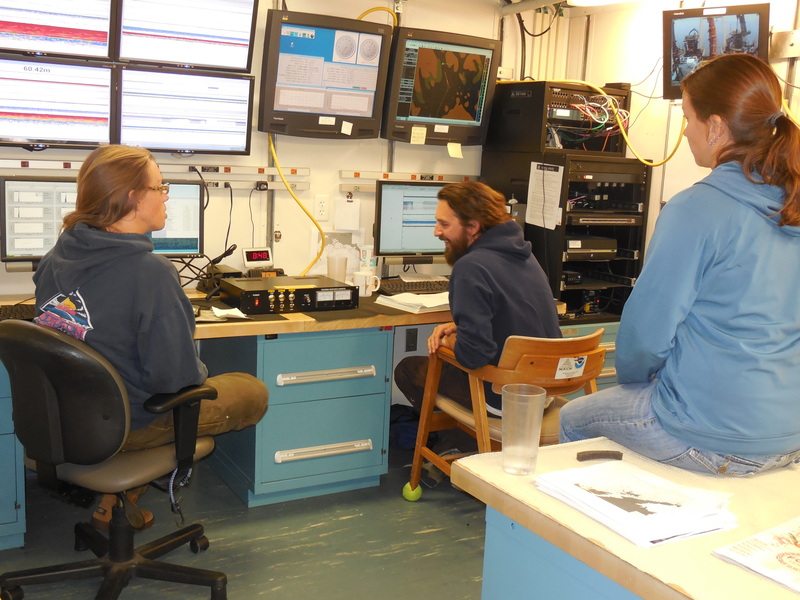 Besides the mid-water trawling, information about the pollock population is gathered in other ways on the Oscar Dyson research vessel. One of these ways is direct, monitoring the pollock by trawling in other parts of the water column; the other way is indirect, evaluating the prey that the pollock feeds on. Scientists use acoustics to locate the signal for the fish. Sometimes this signal is noticed near the ocean floor. 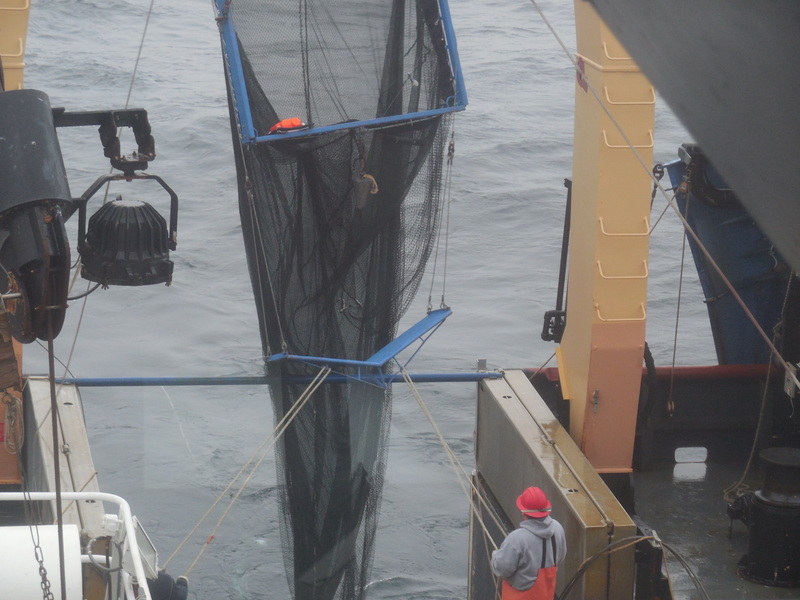 In this case, the PolyNor’eastern (PNE) Bottom Trawl Net is used to trawl for fish. This net is a large net equipped with rubber bobbins that allow it to get close to the benthic region of the ocean without dragging. During this research expedition, we used the PNE net six times to survey pollock. Often times these trawls brought up other interesting sea life, that were quickly assessed (identified, measured, and recorded) and returned to the ocean. The majority of invertebrate sea animals such as poriferans (sponges), cnidarians (sea anemones), annelids (segmented worms), mollusks (barnacles), arthropods (hermit crabs hiding in mollusk shells), and echinoderms (sea urchins and starfish) were brought up in these hauls. In addition, some interesting species of fish (see this blog’s Trawling Zoology segment below) were gathered in bottom trawls. 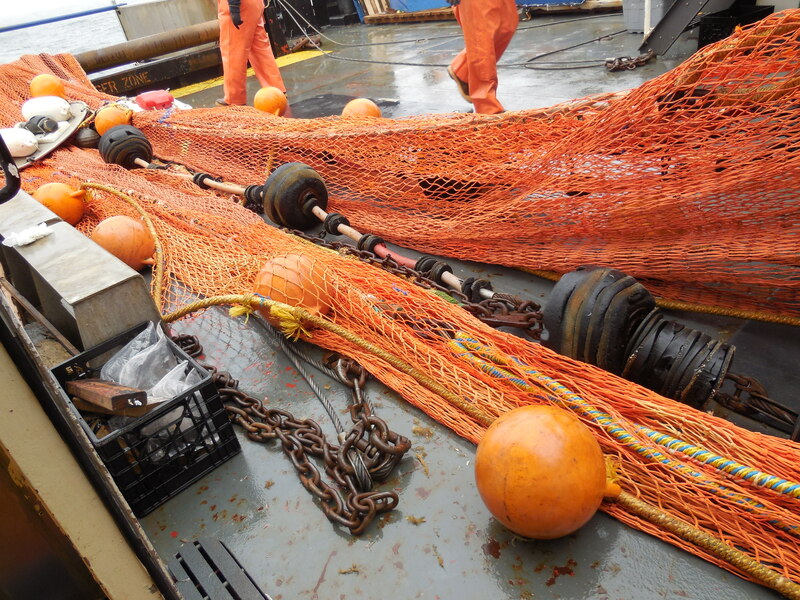 We use the Methot trawling net to sample krill, a type of zooplankton that pollock feeds on. On this voyage, the Methot was used 6 times as well. The Methot is a single net with a large square opening or mouth. The net is deployed from the stern and towed behind the vessel. Inside the Methot is a small removable codend where much of the catch is deposited. The krill is measured and counted as well. First, the water is drained out, then it is weighed, and a small sample is weighed and counted. Bottom trawls and Methot trawls are both important aspects of the pollock survey. 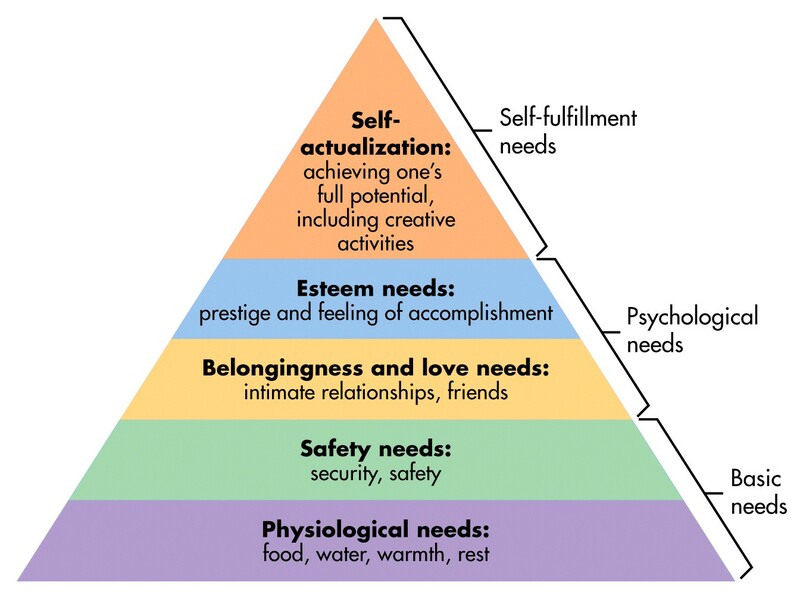 Continuing with Maslow’s hierarchy of needs, I will discuss the top part of the pyramid, how self-actualization, or being involved in creative endeavors to expand one’s full potential, are met on the Oscar Dyson. Since I am an honorary member of the am science team, I am privy to many discussions between the scientists on the team regarding a variety of topics. 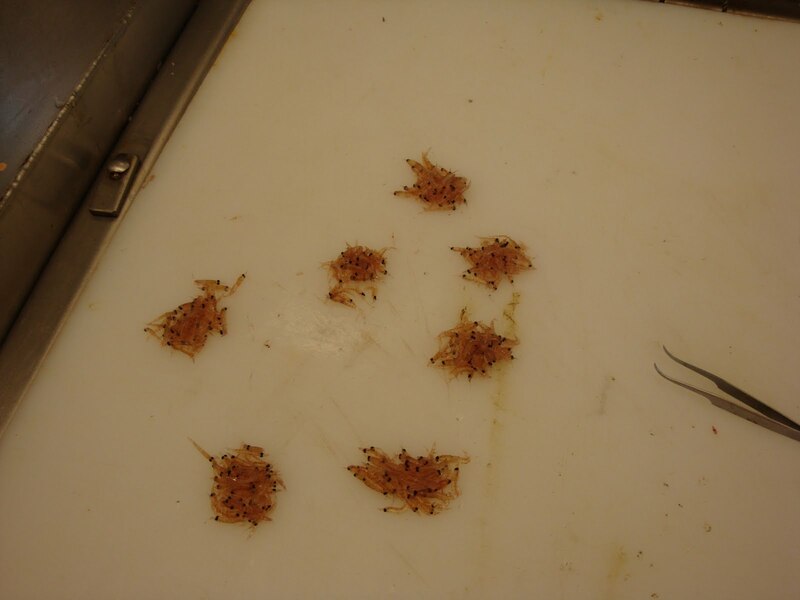 For example, one side project on the mission is to gather information regarding the abundance and distribution of euphausiids (krill) in the Gulf of Alaska. This research project involves the use of a smaller “critter camera,” engineered and built by two of the MACE (Midwater Assessment and Conservation Engineering) group members, to take pictures of krill at various ocean depths and (ideally) reconcile its distribution with acoustic and Methot trawl data. 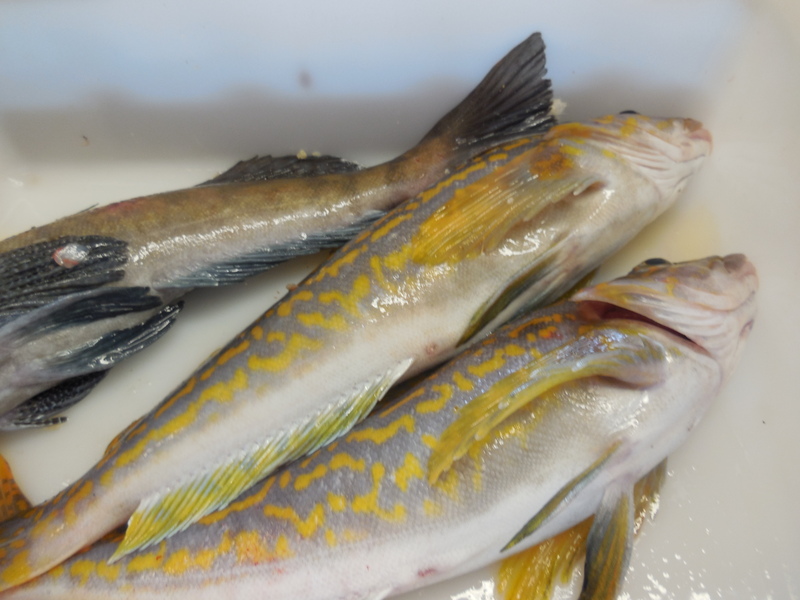 The goal of the project is to provide insight into the feeding conditions of pollock. The discussions between group members involve postulating, speculating, testing, theorizing, analyzing, teaching, and questioning; clearly this meaty dialog indicates that the process of science is an intellectually stimulating and creative endeavor. One of the people who views my blogs before they are posted is the Executive Officer (2nd in Charge) of the crew on the Oscar Dyson. 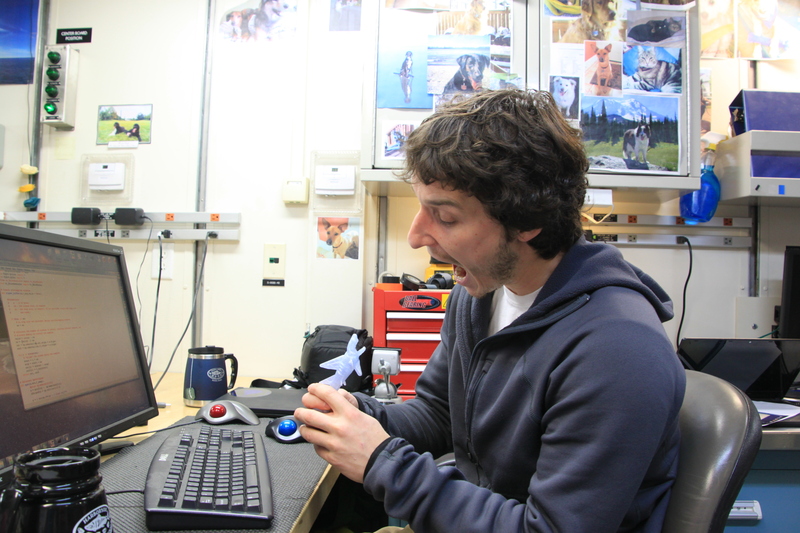 His name is Chris and on this mission he is “augmenting” or filling in for another employee. Chris administers the day-to-day operations of the crew including logistics, payroll, and travel. 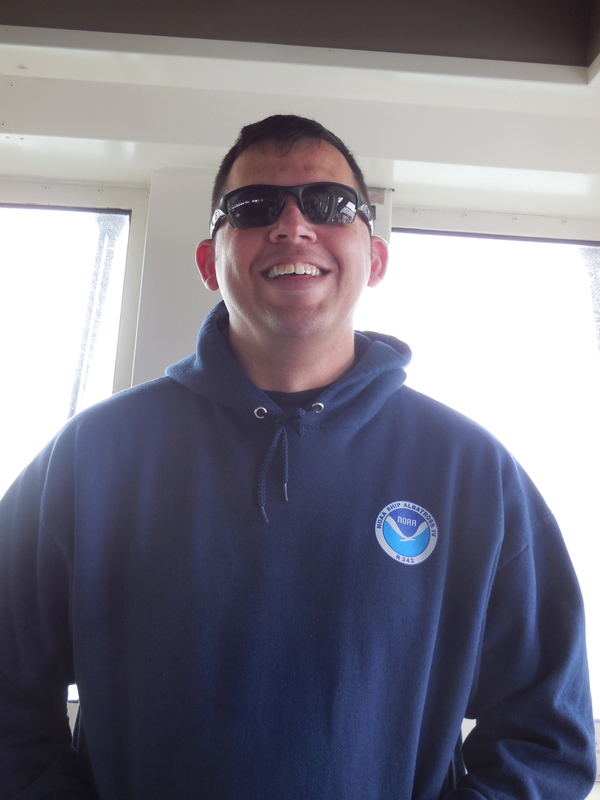 Chris is a member of the NOAA Corps; he has both a BS in Marine Biology and an MS in Management Information Systems from Auburn University located in Auburn, Alabama. He grew up in various places in the Midwest (his dad was in the U.S. Airforce) and has worked in several fields including information technology and zookeeping. He applied to the NOAA Corps because he wanted to live and work near the ocean. In previous posts, we have explored invertebrates encountered on this mission. Today we will look at a group of vertebrates from the class Osteichthyes, a word that comes from the Greek osteon meaning “bone” and ichthus meaning “fish.” We will focus on some of the other fish besides pollock found in bottom trawls. These bottom-dwellers are quite interesting creatures. 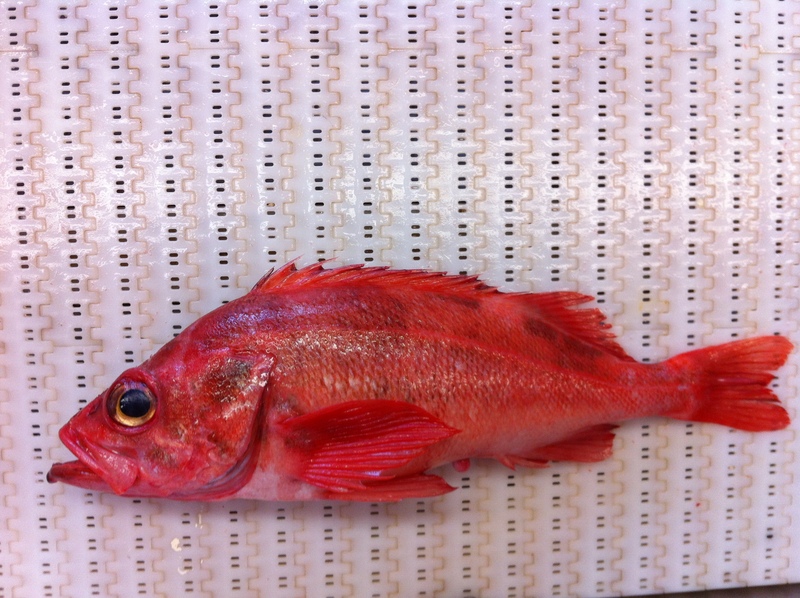 One of the most frequently found fish, other than pollock, is a type of rockfish called the Pacific Ocean Perch (POP); the species name is Sebastes alutus (Greek: Sebastes “August, venerable”, alutus “grow, nourish”). This fish actually was seen in many trawls, both mid-water and bottom. As the picture below indicates, the body and fins of the POP are light red; however, there are dark olivaceous areas on back under soft dorsal fin and on the caudal peducle. The maximum length of the fish is 55 cm and it is commonly found at a depth between 100-350 m.
A fish that belongs to the same genus as the POP is the Tiger Rockfish, Sebastes nigrocinctus ( Latin: niger, “black” and cinctus, “belt”). We found this fish once in a bottom trawl. 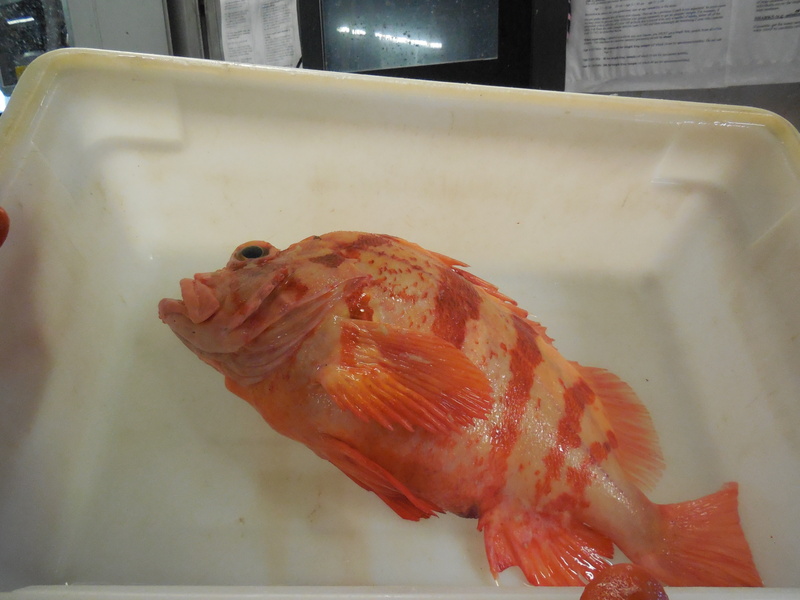 The bottom of the tiger rockfish is light red to orange with several broad, vertical black-red bands on body. It grows to a maximum length of 61 cm and is commonly found at a depth between 55 to 274 m. Notice how similar it looks to the POP. One of the most colorful fish that was found in a bottom trawl was the kelp greenling, Hexagrammos decagrammus (Greek: hexa, “six”; grammus, “letter, signal”, deca, “ten”), a fish that generally hangs out in rocky reefs and kelp beds in relatively shallow waters (up to 46 m). The fish is olive brown to bluish grey, speckled with irregular blue spots if male and reddish brown to gold spots if female (those we caught were most likely female). The fish reach a maximum length of 53 cm. 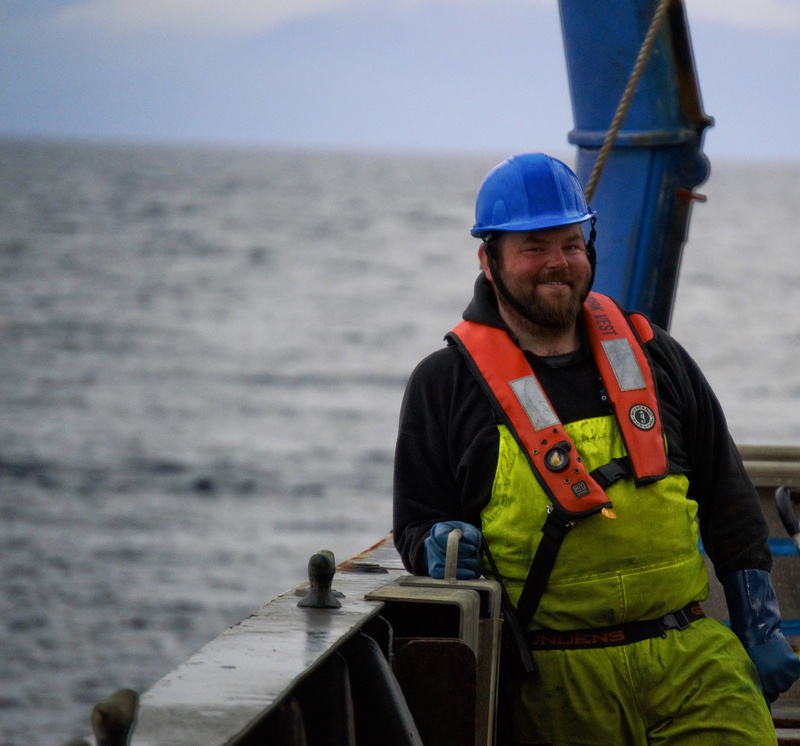 In a recent post, I talked about how one of the things we are doing on board the Oscar Dyson is trawling for fish. 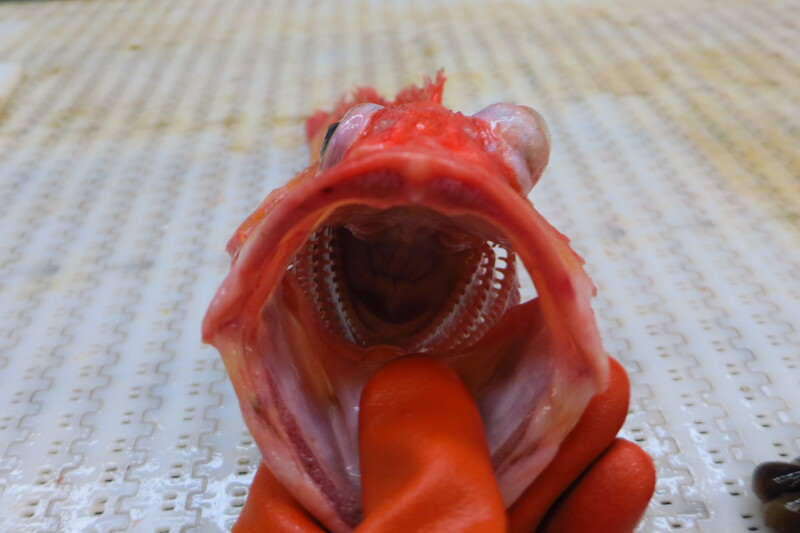 The video from that post showed what happens in the fish lab during a midwater trawl. 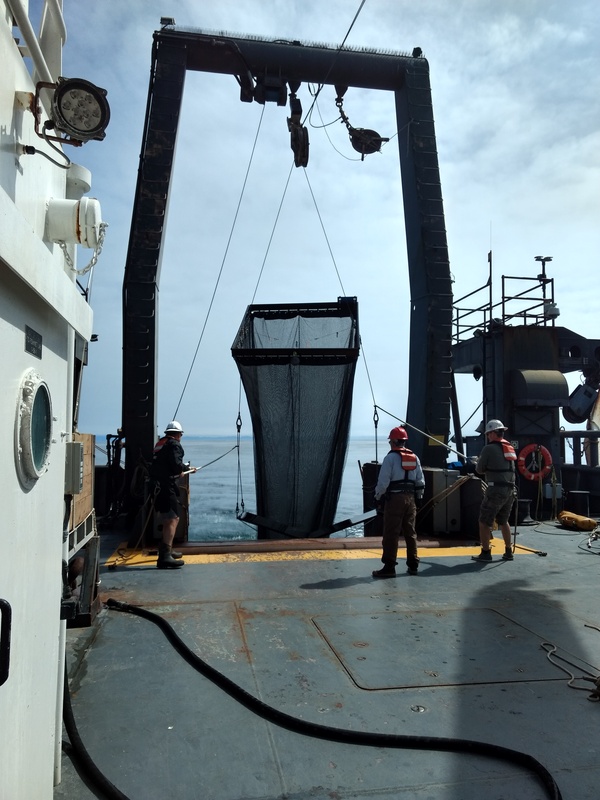 Remember that there are two nets we have been using for a midwater trawl: first, the normal Aleutian Wing Trawl, or AWT, which catches plenty of pollock, but also the 83-112 to which adjustments are being made to use this bottom trawl net for midwater fishing. But what about using the 83-112 for its original purpose: bottom (or benthic) trawling? The 83-112 net used for bottom trawls (and comparison midwater trawls on this ship). I’ve been lucky enough to see two bottom trawls on this cruise, although neither of them were actually during my shift. 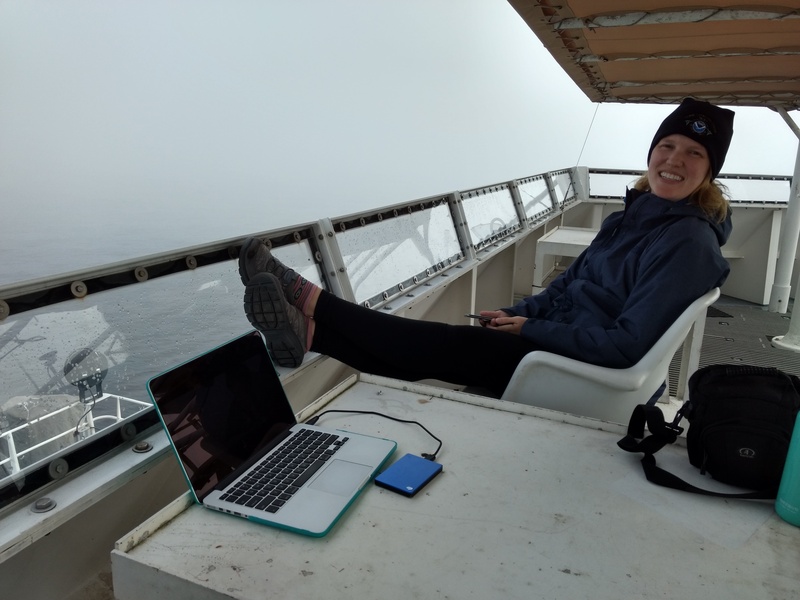 My wonderful roommate Carwyn, one of the other scientists on board, came to tell me about the bottom trawls so I could see all the neat creatures from below! A bottom trawl is used when the pollock are swimming much lower in the water column for one reason or another, but in trying to catch them, there are always many more “trawling treasures” that find their way onto the fish table. The process is basically the same as a midwater trawl, except the 83-112 net is lower down in the water towards the bottom of the sea floor (hence the term bottom trawl). The net is also much shorter in length than the AWT using in midwater trawling. DYK? : How do the scientists know exactly how far down the net is in the water column? One of the sensors attached to the net is called the SBE (Seabird) 39. This will measure the depth and temperature during the trawl and determine the average head rope depth (which is the top of the net) and average temperature during the trawl between EQ (equilibrium – start of the trawl) and HB (haul back – end of the trawl). The sensor is then uploaded on the computer and the data is used by the scientific party. 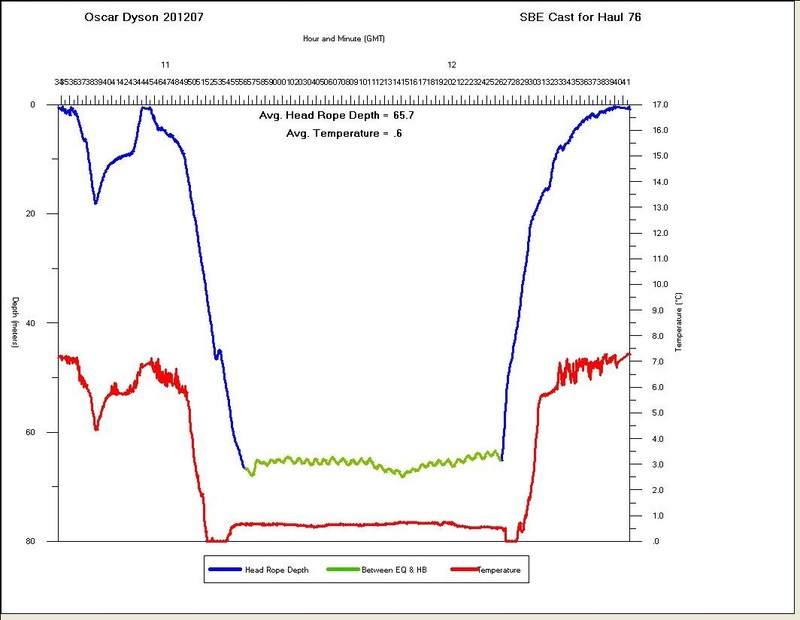 This plot is used to determine the average head rope depth and temperature during the trawl (between EQ and HB). Depth is measured in meters and temperature in degrees Celsius on the y-axis versus time on the x-axis. 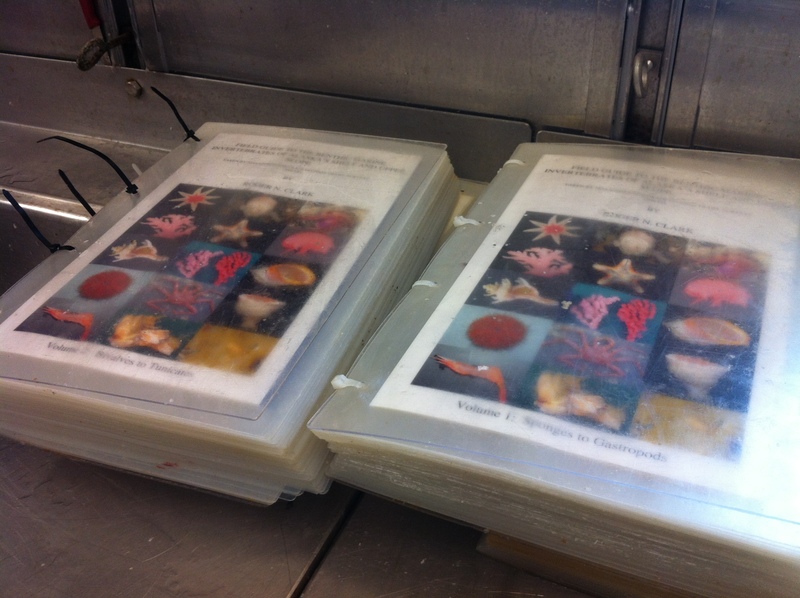 Field guides to classify various species found in the Pacific Ocean. I attempted to classify all of these great bottom trawl treasures, and discovered that this was way easier said than done. There are some books in the fish lab with photos and descriptions just of the species that may be found around the Alaskan waters, and it was incredibly difficult to nail down a specific species for most of the finds! 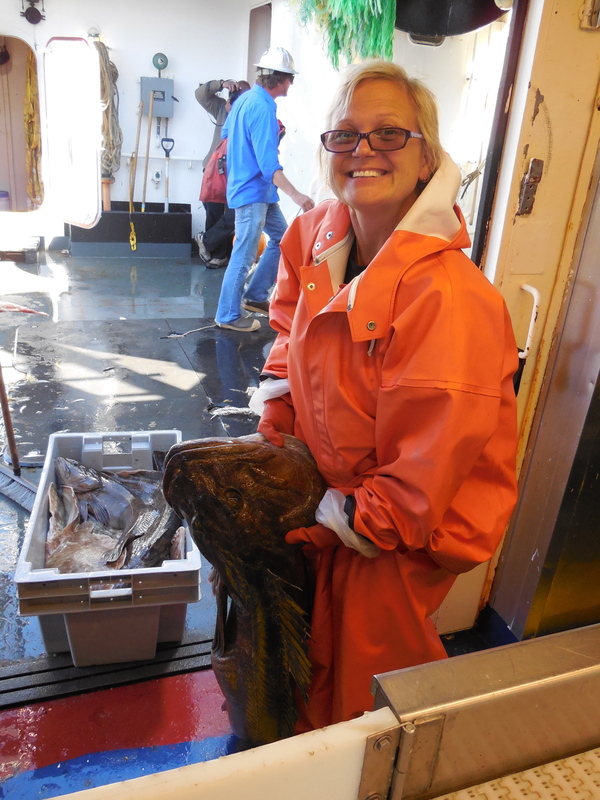 In the bottom trawl, we found things such as the Oregon hairy triton, an unidentified pretty purple star fish, pink shrimp, basket stars, sheriff’s star, halibut, crabs, pacific cod, sculpin, Pribilof snail, sea anemone, scallop, sponge, sea pens, arrowtooth flounder, flathead sole, chiton, and seaweed. 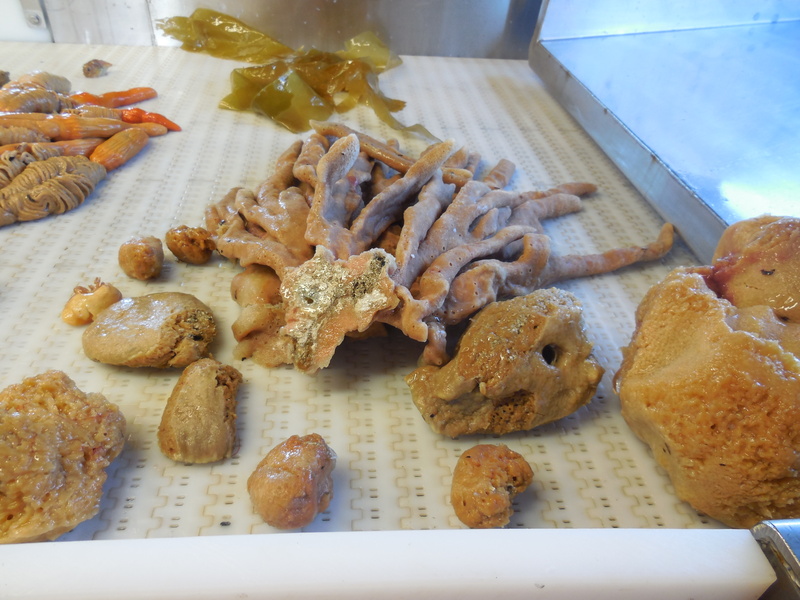 Enjoy the slideshow below with photos of the bottom trawl treasures (and an interesting fact or two about some of them) or click on the link to open it in a new window! The other trawl we’ve done outside of the normal AWT (Aleutian Wing Trawl) midwater and 83-112 midwater comparison trawl is something called a methot trawl. This uses a completely different net because the others have mesh that is much too large to catch something so small. The methot net has very fine mesh and a hard square opening with a fixed height. 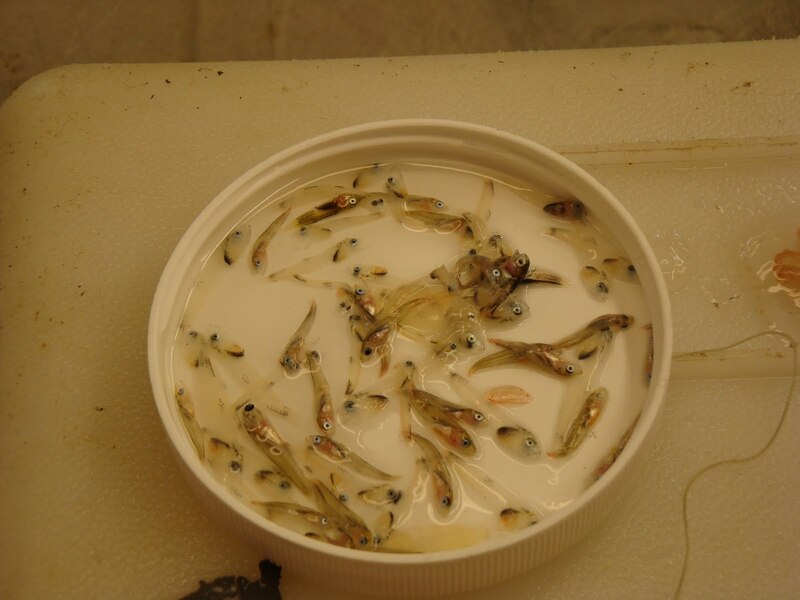 The cod end (very end of the net) is actually a small white container because the organisms collected are so small. 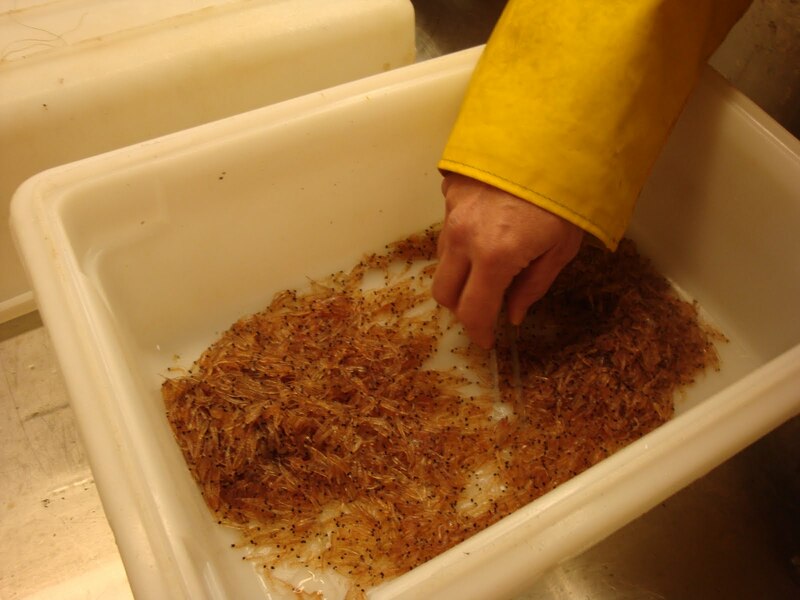 A methot trawl is done to collect euphausiids, otherwise known as krill. Sometimes other microscopic (small) organisms are collected as well, including jellies, salps, and amphipods, which must then be carefully sorted out. DYK? : Krill are part of the phylum Arthropoda, which includes species with an exoskeleton and jointed legs such as spiders, crabs, insects, and lobsters. They are an important part of the ecosystem because these small, reddish-orange animals are a source of food for many larger animals. 1. Dump contents of the hard cod end container into a large gray bin. 2. Remove any large jellyfish (and weigh those separately). 3. Rinse contents from the gray bin into the sieve to remove any water. 4. 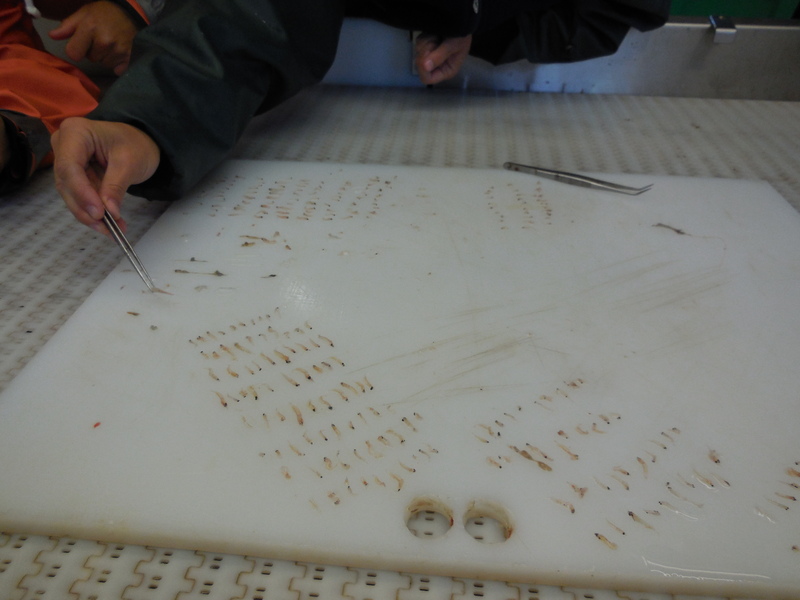 Using tweezers, sort through the small microscopic organisms on the sieve and remove anything that isn’t krill. 6. Collect a random subsample in a scoop and weigh it. 7. Count all of the krill in the subsample (yes, this is as tedious as it sounds!). 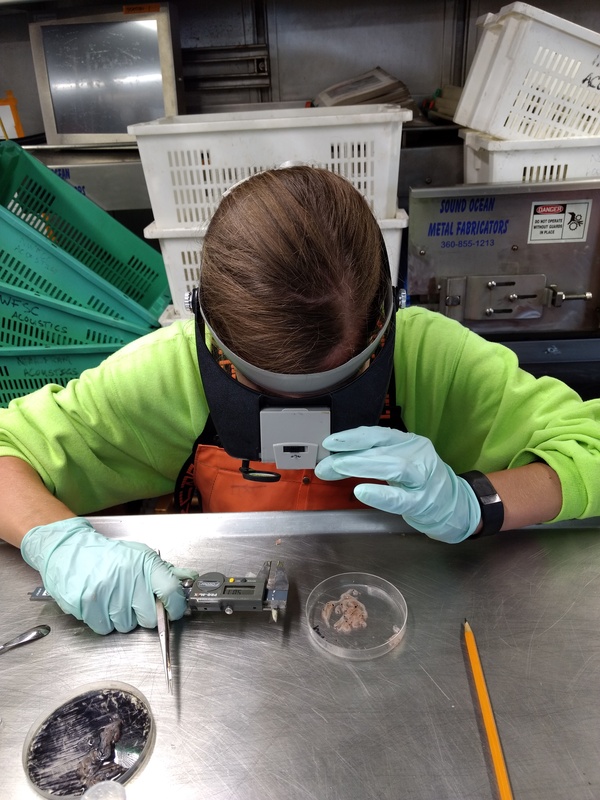 Processing a methot trawl: removing water with the sieve, sorting through all of the krill and pull out any amphipods, salps, or jellies with tweezers (to weigh separately). Heading down to check out the bowthruster on the Oscar Dyson! It continues to be a little slow on the trawling during my shift, but that’s okay, because I was lucky enough yesterday to get a tour of some of the lower bridge levels from the 1st Assistant Engineer, Tony. I plan to share some of the facts I learned related to chemistry and biology from this tour (and other things on board) in one of my next blogs, so be sure to look for all of the info on the generators, sea water purification, MSD, cathodic protection system, and more. We did have two trawls yesterday (July 10) – the first was an AWT midwater trawl that had caught so many fish it was actually a “splitter”! In a splitter, there’s an extra step between hauling in the net and getting it to the table in the fish lab. The cod end of the AWT net is opened over a separate splitting crate, where there is another net underneath that will only take about half of the fish to release on the table. The rest are then returned to the water. Splitting an AWT midwater trawl that collected too many pollock. We also had drills yesterday (these are required once a week) and after gaining permission from the bridge, I checked in to my muster station (which is in the conference room for the science party, away from all of the action) and then went and watched what everyone else on board does. When we have fire drills in school, the alarm sounds, we walk outside, and wait for the “all clear” before heading back in. When they have fire drills on the Oscar Dyson, they use a smoke machine to produce smoke, there is an on-scene crew (first responders), there may or may not be a “victim” involved, the hose team actually dresses out (with the help of another person on the alpha or bravo firefighting teams), and the fire hoses are actually used. It may seem like old hat to everyone else on board, but I found it incredibly interesting to watch! 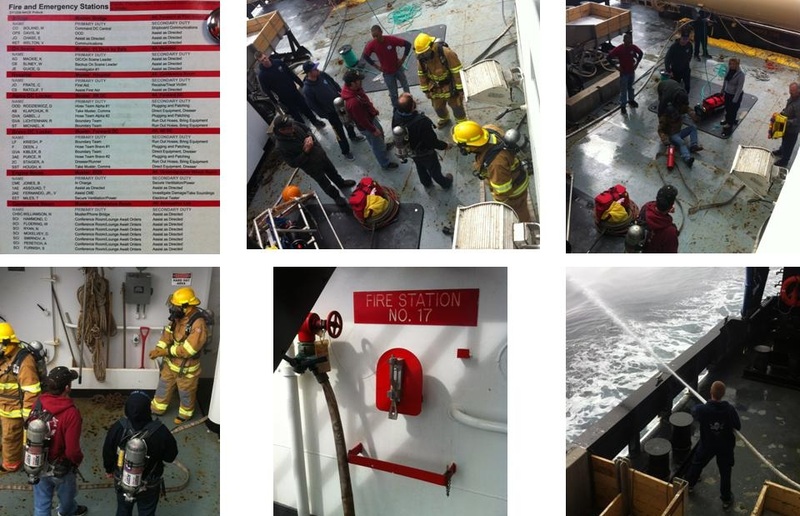 Fire drill (smoke in the oceanic winch room) on board the Oscar Dyson. Following the fire drill, there was an abandon ship drill, where everyone on board grabs their survival suit, PFD, and heads to one of three life rafts (there are actually 6 on the ship). The CO had me stay up in the TV lounge so that my life raft (#5) wouldn’t have a “full muster” until they sent out a search party to find me. Just as there are two people on hose team in both alpha and bravo for the fire drill, people must go in pairs for the search party, so Patrick and Rick came and found me. I think some people thought I’d actually not heard the alarm (I was wearing headphones), but I was instructed to be up there! 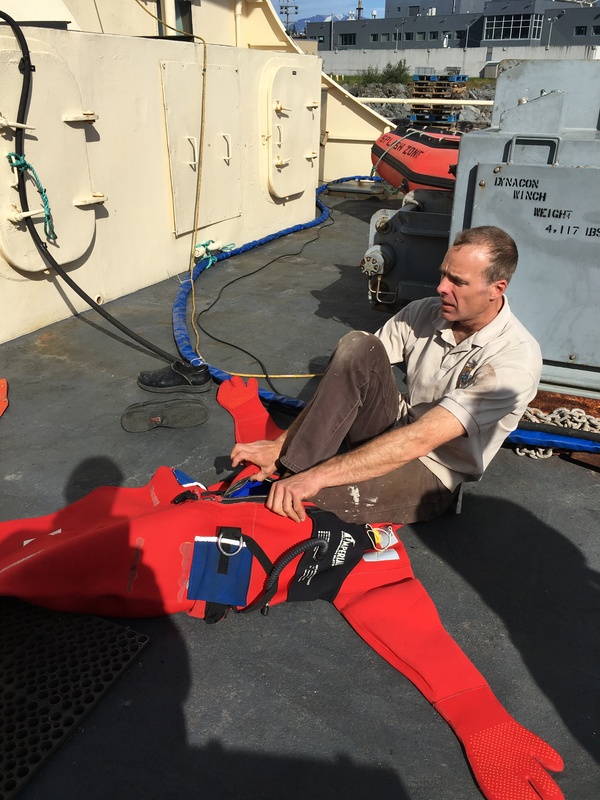 We will have one more day of drills before we get back to Dutch Harbor, so maybe I’ll actually don my bright orange survival suit, which other Teachers at Sea in the past have affectionately called the “gumby suit” (even though Gumby was green). In yesterday’s AWT midwater trawl, we had a new visitor in the fish lab. Introducing the lumpsucker! Me (left) and ENS Libby (right) showing some love for a lumpsucker (middle). The lumpsucker is in the family Cyclopteridae, which is derived from Greek words that mean circle and fin in reference to their round-shaped pectoral fins. There is a sucker on the bottom of them, so when we put this little sucker in some sea water while we were processing the fish, he stuck himself to the bottom of the container! 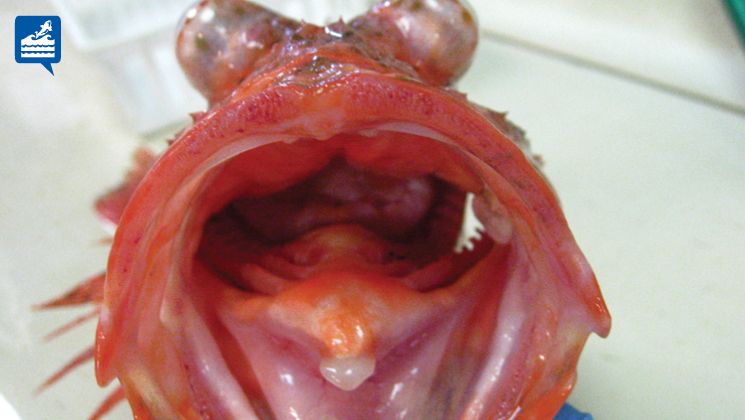 Lumpsuckers are poor swimmers, so they are mostly benthic, meaning they stay at the bottom of the sea floor. However, that doesn’t mean they are incapable of swimming (especially since this one was caught during a midwater trawl). We took some photos and tossed this little guy back to sea, so hopefully he makes it! What are krill, you ask? They’re animals in the Phylum Arthropoda, which means they’re related to insects, spiders, crabs, lobsters, etc. They have jointed legs and an exoskeleton, are usually a couple centimeters in length, and are reddish/orange-ish in color. They can often be found in dense schools near the surface of the water, and play an important role in the ecosystem as a source of food for lots of larger animals (like fish, whales, & penguins). I’ve mentioned the two types of trawl gear that we use to catch fish, but if we want to catch smaller things like plankton, the mesh on those nets is way too small. 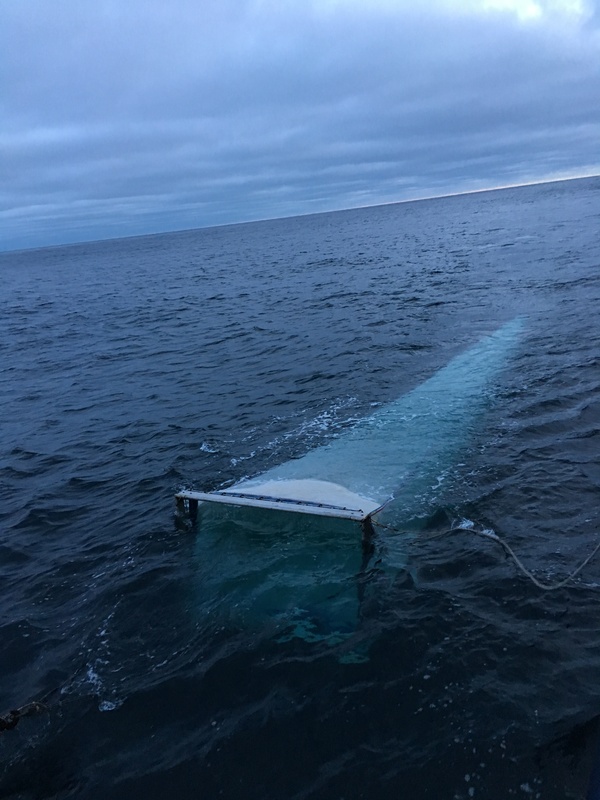 Therefore, we use a third type of trawl called the Methot which has very fine mesh to corral the plankton down into a collection container at the end of the net. In addition to having a hard container at the end- as opposed to just a bag/codend that you see in the fish trawls- the Methot trawl also has a large metal frame at the beginning of the net. Check out the photos below. The Methot trawl being taken out of the water. Note the square frame. The container that collects all of the plankton in the net. After the net is brought back on deck, one of the fishermen or deckhands brings the container of krill into the fish lab. 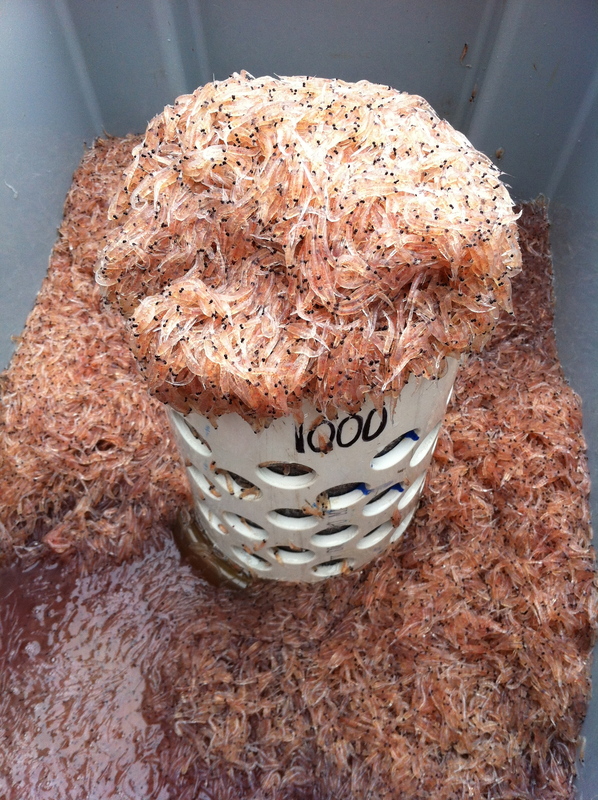 The first thing we do is dump the container into a sieve or a bucket and start picking out everything that isn’tkrill. The two most common things that are collected (besides krill) are gelatinous animals (like jellyfish & salps) and larval fish. The fish get weighed (as one big unit, not individually) and then frozen for someone to look at later on. The larval fish that we separated from one plankton tow. After sorting the catch, we’re left with a big pile of krill, which gets weighed. We then take a small subsample from the big pile of krill (it’s a totally random amount- depends on how much we scoop out!) and then weigh the subsample. Then the fun begins, as I’m the one that does this job- I get to count every single individual krill in the subsample. Tedious work. All of the data is then entered into the computer system, and the krill and anything else that we’ve caught (besides the larval fish) are thrown back into the water. Sorting through the big pile of krill. 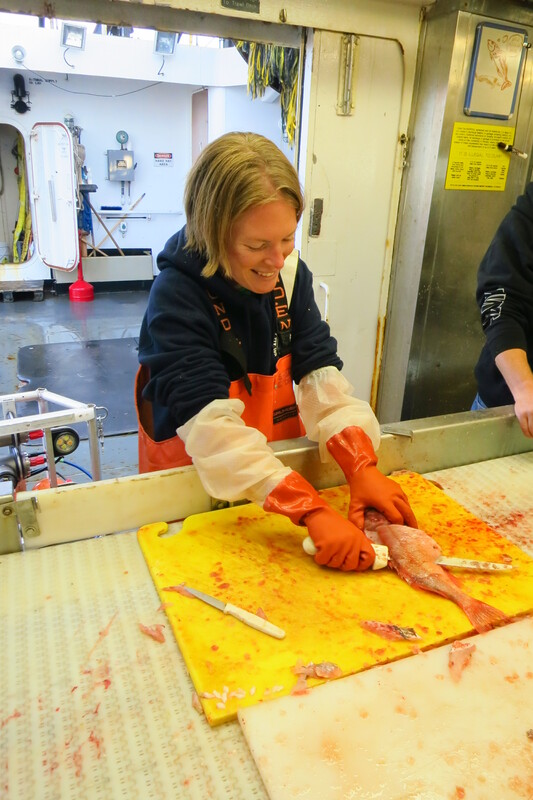 I mentioned that once we’re done with the krill, we throw it back into the water- that was until I came aboard! My eel (Ms. Oreelio for those of you that don’t know!) eats dried krill, and I’m going to run out soon, so I figured I’d take these krill home with me! I got a gallon-size baggie from the galley (kitchen) and filled it up with krill, and holy cow, it’s a lot!! I stuck it in our freezer- which is at -22 degrees C (or 7.6 degrees F) so now I have a big frozen block of krill to take back home with me. What a great souvenir.